Like making music? Make sure you’re ready when inspiration hits when you’re on holidays. 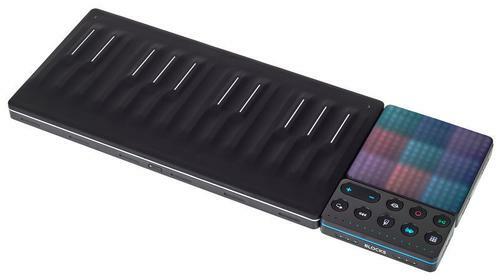 ROLI’s Songmaker Kit combines three things, a Seaboard Block, Lightpad Block M, and Loop Block to allow you the freedom of expression when you create your next tune. This super portable kit is powerful, so don’t be fooled by its size. The Seaboard block works well as a standalone instrument, with a 5D touch technology and more than 200 free sounds, with a free software bundle that includes NOISE, Equator Player, Ableton Live Lite, BLOCKS Dashboard to seamlessly integrate with your laptop. Connected with the Lightpad Block M, with a pressure sensitive surface that allows you to shape your sound through gliding, or shifting and other intuitive gestures, to create a polyphonic experience. The ROLI Touch Block allows you to adjust the behaviour of the Seaboard block and the Lightpad and allows you to create unique soundscapes in real time.